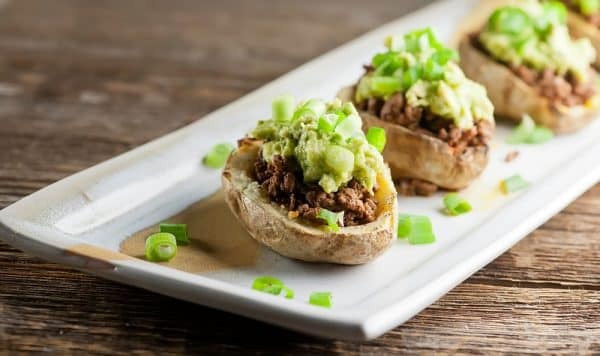 This recipe for potato skins tacos leaves the taco shells behind for easy and delicious eating! Welcome to your new favorite stuffed potato supper. Pierce the potatoes a few times with a fork and microwave until tender, about 8 minutes. Cool until you can handle them. Cut potatoes in half and scoop out the insides, getting as close to the skin as you can without breaking it. Save the scooped out potato for another use. Brush the insides of the potato skins with olive oil. Sprinkle with salt and pepper and broil until they start to get brown and crispy, watching carefully so they don’t burn. Set aside. Crumble the ground beef into a large skillet and cook over medium high heat until brown. Stir in spices, and then stir in tomatoes. Simmer for about 5 minutes. Taste and add more chili powder if you want a little more heat. Divide the taco meat among the 4 potato halves. Top with your choice of toppings and serve at once.